This is a great buy on this TOUGH to find Embossed Silver Refractor Card !! You will receive the item(s) pictured. 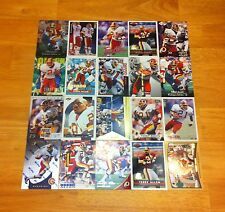 The cards would make a great addition to anyFootball card collection! Terry Allen. -The item(s) in picture or scan is the one you will receive. PWE, Pease choose. Player: Terry Allen. 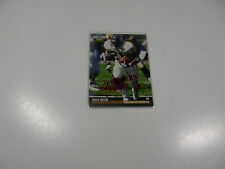 Set: 1998 Collector's Edge First Place Rookie Ink. Attributes: Autograph. Manufacturer: Collector's Edge. SetType: Insert. Year: 1998. Sport: Football. Hope to see you again soon! Don't see what you are looking for?. I may have it. From 1996 COLLECTORS EDGE I have a extremely rare GOLD Version of the Running mates insert card. Super scarce gold jumbo version. Only 200 of each card made.In excellent shape. VERY RARE! WOW! See pics! Check out all of my other vintage stuff on now! Lots more coming too! My Feedback speaks for itself, fast shipping and quality product! Smoke Free Home ! S&H is $2.50 and includes confirmation. I accept Paypal orders only. Item#: PC16. 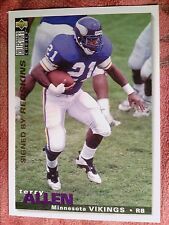 Player: Terry Allen. Set: 1998 Black Diamond Premium Cut Triple. SetType: Parallel Insert. Manufacturer: Upper Deck Co. Year: 1998. TERRY ALLEN. 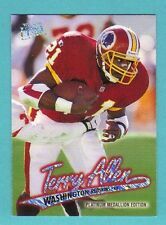 You are getting a nice Card of Terry Allen #114. "50th Anniversary". ~ Rare Card ~. SHORT PRINT CARD. Only 50 made ! You don't want to miss out on this one ! This is a perfect addition to your collection ! 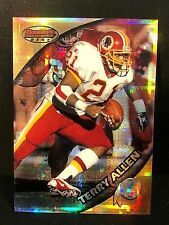 For sale is the Terry Allen card pictured. The card is in NrMt-Mt condition or better. Shipping in the USA $3.00 for this card and up to 5 additional cards ship free. I ship items ASAP after payment is received. Comes from a smoke free home. Thank you for looking.